Hillie, I’ve already moved Exeter to Sussex, so Belfast to Glasgow is just the logical next step! I was “treated” (open to debate how well that was ) at Paisley rather than Glasgow - although they are very close geographically, so I wasn’t treated by Wallace and I couldn’t say if he is/was at Glasgow or Belfast. Sounds like I would have been better of if I had seen him! However, as I am now whole again and on the mend, I can say, that it can always be worse! Pam, good to see you’re recovering well. Pam, I just twigged on “Glasgow”, just as a few of us have been discussing the Glasgow study of almost 1000 non-op ATRs treated by the same senior OS (Wallace?). Were you part of that now famous group? I think his paper shows how unusual you were to get the clots (DVT & PE). Time to buy a lottery ticket? This my be a good time to step it up a bit, and not wait for it. ok that’s interesting. I assumed it was the DVT, possibly not then. My feet (more than legs) have been different colors for many years. Left one darker-redder. Pre-ATR#1, I think. Whenever I mention it to an MD they look at me as if I’m the Leader of the Worried Well… so I’ve stopped. Good news there Pam with regard to the heel raises, when I started being able to do a single heel raise it was only tiny, and seemed to make no progress, but a month down the line it started making good progress and higher lifts. Your different coloured legs may not be the DVT, my bad leg was still darker at your stage, although I’m fairly sure its sorted now (8months). Enjoy the lower limb gym, it was my life saver! My PT told me to do, post-op at about your stage of recovery. Stay incremental, and give your leg hours or even a day or 2 to “digest” any big “steps”. It won’t slow you down much compared to a big setback. Am empathetic with your ‘1 forward and 3 back’. 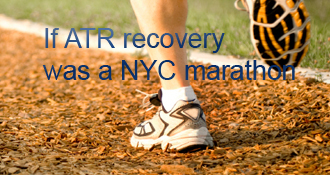 It is definitely a challenge this ATR recovery. This site is really good even at this stage as friends and family I think must be pretty tired of the ATR recovery woes/success’. Takes a fellow sufferer to understand. Hang in there - full recovery is in sight! Ya, going FORWARDS is frustrating ENOUGH!! I lost a month from a dumb PT after my first ATR. (Her patient wasn’t too smart either! ) Even after the risk of rerupture is gone, it’s best — and hard — to know where to draw the line. Some people seem to do pretty well “pushing through the pain” and using body-builder techniques to rebuild the calf and surrounding muscles and tissues. And some suffer setbacks and have to back off and let things heal. When the newest and best evidence on ATR rehab generally shows that the fastest common rehab protocols — like bit.ly/UWOProtocol and the new Exeter protocol — work the best, it’s tempting to just keep going faster and faster, doing more and more. But it’s still a balancing act, and being incremental is still the best policy, maybe for close to a year — or until you can really start forgetting your ATR! I can sympathize. I had a lot of forward/backwards progress and still do at times. It’s hard to be incremental. Hang in there though–I’m noticing that recovery takes less time the further along I am in the healing process. Sad to hear, but I hope you get back up to speed soon. Hi lovely to hear how you are progressing as you are similar time to me, I ruptured on 4th June, surgery on 13th. I am walking in two shoes, finding I still have quite a limp when walking outside, am doing all the exercises given by physio but feel its all quite slow! Taking one day at a time seems to be the moto of the last few months! Excellent site ! Activity this site incredibly. I learn many important subject from this site. Thanks admin for sharing for instance , nice site. I fear the cook, clean and drive does get a bit old after awhile Sounds like you are doing great. The ROM definitely improves over time. That’s great that you only have a 1 cm difference between calves. Mine is twice that. Good luck with the rest of your recovery. Thanks for the update! @Loumar747 - Thanks for your support. I totally get the “trust” and re-rupture thing; particularly the re-rupture, which is never far from my thoughts. My physio, this week suggested I try a heel drop on my injured leg on its own - I had to refuse that one, which she was ok with (and she does say I should listen to my body). I definitely do know how you feel. Did my first ‘heel drop’ at physio yesterday. When the physio explained the exercise, I was horrified at the thought and said, “Are you sure?” She assured me that it would be okay and that now part of the healing process is building trust. That darn fear of re-rupture is always lurking just below the surface!! Sounds as though you are doing well. Keep up the good work and I’m really glad that you’ve turned the corner from those bleak, dark days!!!! Have a look at kellygirl’s recent posts as she has some great exercises (with photos on how to do them) that should help you with your walking now you are back in 2 shoes. Great news Pamg, the world is your oyster!! I’ve seen many people not start physio week 10. Heck, before my re-rupture I was told I may not need PT. I am going to bring it up again. LouMar, KellyGirl and others have posted some of their exercises in addition to the link Norm has posted with other protocols. If you haven’t found bit.ly/UWOProtocol yet, go find it and print it out. And the protocols we discussed on sudsy’s site recently, too. And catch up gradually. And DON’T go slower to lower your rerupture risk, because the evidence is clear that it does the OPPOSITE. And thank you Norm for drawing my attention to the myth of aspirin preventing DVTs! Who would have known, given all the advice to take low dose aspirin before long-haul flights. I had no idea that it was only any use in preventing arterial clots, not venous. Sad that I had to go through the experience to learn this, lol! Stay close to a good proven protocol. If you’re behind, catch up gradually, but do it. If you do remove wedges gradually, do it at bedtime and sleep in the boot, to separate the ankle-angle change (stretch) from the WB loading. It’s always frustrating to get bad service, and getting it from health pros is the worst, but it happens a lot. The Yanks pay top dollar for their medicine, and many studies (and our informal ATR survey here) suggest their not getting consistently excellent care either. Way too much random (& non-random) variation. Different systems produce different problems. I lucked out with my ATRs in Ontario, but some of my neighbours got less impressive care. I’m 8 weeks post injury so 2 weeks ahead of you but two week behind! I was told still not to put any weight at all on the injured leg at my week 4 appointment - and my next appointment was at week 8. I have been ignoring this since about week 5 because I worried about the lack of moving and DVTs (ha!). I’ve been gradually increasing the amount of weight, but very carefully and maybe too carefully, but I’ve no intention of putting myself at the mercy of the NHS again through a re-rupture. On Tuesday (my week 8), the consultant told me to start putting weight on it in my bare feet - not possible atm and I’m not pushing that one. I’ve taken another wedge out - I was told to take one out at week 6 but no further instruction. And you’re right, we have paid for this rubbish service through our taxes and NI - sadly I’ve been paying longer than you I think it’s more the disappointment when you’re led to believe something will happen within a certain time-frame and then treated as if you are unreasonable when you question why it didn’t, as happened to me today by a receptionist; not medical staff. I share your frustration! I was told I would have an ‘urgent’ appt made for me on my last visit. I got the distinct feeling that they had ‘forgotten’ the PT schedule. I know our NHS service is supposedly free, but when you’ve paid taxes and National Insurance contributions for 23 years - the free bit sounds bit hollow. Don’t rush your own exercises, I’m sure you know your limits. I was told to FWB 3 days ago. (6wk post op) I’m hobbling, but feel liberated! Aspirin works in a very different way than the so-called “blood thinners”, and the two groups don’t necessarily prevent or minimize or break up the same clots. I know only enough about it to know that it’s not simple. It’s pretty remarkable how well Warfarin works in huge groups of heart patients who are at risk of clots — ESPECIALLY when it’s combined with home- or self-monitoring for blood (”INR”) levels. No, I’m guessing they wouldn’t use it over here as a preventative for ATR even if it was effective because of the cost to the NHS. In my case it’s being used as an anti-coagulant, but I know that it can be used for prevention of strokes caused by clots in atrial fibrillation. However, my mum is a sufferer of AF and she wasn’t offered it, but instead put on Warfarin, so not sure who would be prescribed it for this condition. Good old low-dose aspirin might have been a reasonable preventative in my case I guess. Pam, because of my OTHER online fetish — heart health, since I had a heart valve replaced — I get notices of lots of articles on trials for Rivaroxaban and other Warfarin alternatives. But I generally don’t read them — and none of them is about using them to prevent DVT after ATRs, either! I was on heparin injected into my stomach (ouch) in hospital but now I’m on a newly licensed drug (in the UK at least) called Rivaroxaban (Xarelto, elsewhere). It’s only licensed for short term use here, which is fine for me as I’ve only to be on it for 6 months. 15mg twice daily for 21 days and then 20mg once a day for the remainder. I don’t blame you for being slow to treat it seriously, and I’m impressed that you basically got the diagnosis right! Are you doing daily Heparin shots, or what? Wow! I know exactly what you mean when you say “it just doesn’t happen to me”. I’m glad this is behind you. How scary. There is someone else on this site who developed 3 clots. 1 behind his knee and 2 in his lungs. Yes, sorry, that would have been most useful for me to have described the symptoms. My brain hasn’t recovered! So about a week before I went into hospital (week 5), I had a “funny turn” where I got up from lying down (trying to tune a remote to a TV in our motorhome - which I never did!) and I felt really breathless and had a slight irritation in my chest - like I wanted to cough, but mostly it was just irritating. I sat down and started to feel really lightheaded as if I was going to pass out - hearing and sight felt weird and I felt hot and uncomfortable, etc. My husband was with me and said I went very pale. I put it down to low blood sugar or postural hypotension - getting up suddenly, you know and age, etc. But I felt ok after a night’s sleep. Little did I realise that what I’d experienced was my first pulmonary embolism! Sorry to hear about your clot. Did you have any symptoms? If so, what were they? thanks for your kind words. It was very scarey and although I was aware a DVT was a risk (from my own research), I stupidly put my trust in professionals, thinking that if they didn’t think it (I) was a risk because there was no mention of it, then it must be ok, particularly as I was non-op, not overweight, don’t and never have smoked, not on any medication, etc. I considered all other possible options before I finally decided I was out of them and it was time to got to the hospital. I have had NO assessment other than the Thompson test for the ATR. I was left sitting with my leg hanging off a wheelchair for at least an hour before it was put in plaster, given a pair of crutches, told no weight bearing, and shown the door. No questions about my life style, varicose veins (I have none that I know of) or family history. No warning or advice on what to look out for. Perhaps a low dose aspirin daily and a leaflet describing the symptoms to watch for would have been a good idea. Hi Pam, Sorry to hear that you had a PE, it must have been a scary experience and feels so unfair after also having a ruptured achilles. I was also no op on the NHS and I was assessed fro my thrombosis risk, as in I was asked questions like was there any family history ofDVT or PE, have I had any clotting disorders, did I smoke, any significant varicose veins, age (50 not a risk apparently) and they assessed me as not at risk, so I did not get offered any blood thinning injections. It didn’t stop me being paranoid about getting a DVT though, but I was fortunate. Do you think you were assessed? Would it be worth finding out at your next appointment to set your mind at rest that nothing else could have been done? None of us can turn back the clock, but sometimes knowing that it was just bad luck can help to deal with it. best of luck Pam . I’m sorry that you have had to deal with a clot. I didn’t even know it was possible without surgery (shows how much I know!) How long has it set you back? Are you weight bearing at this point? Hope that your appointment goes well tomorrow. Good luck! Good luck! Those nasty clots are much rarer among the non-op crowd than the post-op patients, but they’re always possible with a big trauma and massive healing. Some docs prescribe Heparin shots to avoid clotting, but that’s rare. Very few patients get these particular complications, but if you’re one of those few, that’s obviously little help. What is clear from the non-op evidence is that the results are essentially identical to post-op IF you go with a fast modern protocol. The results from old slow “conservative casting” are quite inferior, especially in much higher rerupture rates. So don’t let them lead you down the slow path! I agree re the very different treatment in the NHS dependent on where you live. I am non surgery and I decided that I wanted to go into a Vacoped boot so I bought one on Ebay and took it along to my NHS hospital (Derriford in Plymouth) at my 2 week appointment. They were only too happy to let me go into it instead of their standard issue Aircast. They told me that they would like to give all of their patients Vaco boots but that they couldn’t afford to switch. I have not had a scan either but the doctors think that my rupture is pretty high up. As a result they put my boot into a fixed poition of 15 degrees and said that I could FWB. 3 days afterwards I stopped using my crutches (I bought an Evenup for my other shoe to equalise my height with the boot). After 4 weeks I went back and they put the boot at 0 degrees - 10 degrees. The Vacoped boot is hinged and allows a variable setting. I have been moving the setting by 5 degrees each week and I am now at 0 - 20 degrees. I should be getting into 2 shoes by week 8 but I am on holiday so have put that back to week 9. Most times you simply don’t need a scan - I had one to confirm the initial diagnosis, but none during my recovery period. The doctors and physio’s can tell if it is coming together ok.
As for your boot, you’ll be delighted to know that these days, there isn’t really an NHS type! The difference is down to the individual trusts, their budgets, and the knowledge base to enable them to move forward, utilising the latest technologies and treatments. My boot was a Vaco boot which weighed about 6 pounds (2.8kg), and can now be found in an increasing number of NHS hospitals. Every part can be washed or cleaned easily, and can be worn in the pool (check out YouTube). What are you proposing to do to ‘take control’? Do you have copies of the latest protocols? Check out this blog for UWO, and posts this week from Suddsy and me regarding even more recent stuff, and results from Exeter. If you’re going to challenge the regime you need the ammunition. Raised voices and no evidence will achieve nothing as I’m sure you are already aware. Hi, I agree with Musimaster. I had a complete rupture of my tendon and when I came out of the cast my leg was very weak. So, dont worry because once you go to the boot you will be able to really exercise your foot more and gain strength in you leg. You may be surprised of how quickly you gain strength back in you leg. I am at week 5.
thanks ripraproar, I know you’re right about the mind being the biggest factor and of course everyone heals at different speeds. I’d love to be in shoes in 3 weeks time or sometime soon after that. I suppose it’s the lack of information about the hospital plan that doesn’t help. pamg’s AchillesBlog is proudly powered by WordPress and WPDesigner..